This wooden, traditional rat trap is one of the most powerful on the market due to its strong spring. 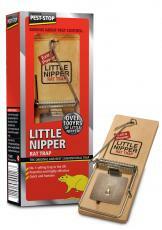 The treadle bait-station is based on the Little Nipper wooden mouse trap design. •Bait is placed on the treadle, which is raised when the trap is set. • The rat has to touch the treadle to reach the bait, triggering the trap. • Full setting instructions included. • Quick and humane.